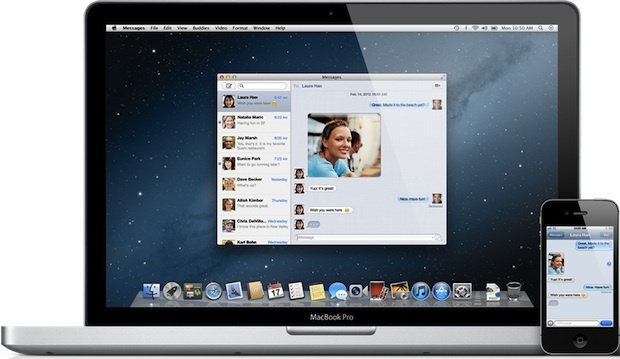 Messages is the all new iChat replacement coming to Mac OS X 10.8 Mountain Lion, it provides for the same unlimited messaging features that iPhone, iPod touch, and iPad users have right now, but brings this right to the Mac desktop. With Messages, you can send photos, videos, attachments, contacts, locations, and more, without any SMS or MMS fees, and you can initiate a FaceTime video chat with a click of a button. While OS X Mountain Lion’s release date is this summer, you don’t have to wait to download Messages for Mac, you can grab a fully functional beta for free right now. Messages will ultimately replace iChat, but all iChat services and protocol support continues to work the same. You’ll still be able to use iChat accounts, AIM, Yahoo Messenger, Google Talk, Jabber, and FaceBook. What are you waiting for? Grab Messages for Mac beta today. If you are a developer and plan on downloading the OS X Mountain Lion Developer Preview, Messages is already bundled and you won’t need to get it separately. Compatibility seems to be limited to OS X 10.7 Lion or later, so earlier versions of Mac OS X will need to update to use the new messaging client. Although I adore Apple’s approach towards their OS, but I think this is a joke. None of the new things that they have included make any sense to be “innovative” as they claim. But you already have services such as Facebook that serve for the purpose. You really want to use Facebook for Texting or IMing? Why? When you can use the same exact programs on all your devices and all the info is instantly on your iPhone, iPad and now your Mac as well. Seems pretty awesome to me. But then again I’m not addicted to FB either. I had to remove my Jabber accounts in order to use Message. iMessage works great so far, as do other accounts, but Jabber would sign me in and then not let me send or receive messages. I personally am thrilled to have iMessage on my computer. There is noting much improved apart from integrating stuff around, I would definitely say Apple has to give it as free update to all OSX Lion users. There is not lot improved from performance/footprint of OS apart from improving Integration of iOS with MacOSX. There are lot of improvements from Leopard to SnowLeopard, but not much from Lion to Mountain Lion, so my vote is no no to $$ update unless its free. I am having issues with message. Since Message does not have an integrated mobile number to it it is not pushing conversations to my phone and vice versa to my mac. Both my mac and iPhone have the same emails linked to them, but it is still not working as advertised. Anyone having the same issues? If an iOS device isn’t receiving messages from the Mac App, try adding the Apple ID to iMessages on the iOS device. how should a do? or if you can’t do anything, I would say that iMessage to mac aren’t that good as it could be..
My issue so far is, I keep entering the username and Password that I use for my Apple Acct and it keeps prompting me for my password over and over again, even though I know I have it correct. Has anyone experienced this? and did you find a fix? Does anyone know how to disable chat logging? My Gtalk automatically logs on the web, so I don’t care to have a local copy stored on my computer. for the most part it works great, except for one part maybe you could all help me with. I also have an iPhone 4, and i use iMessages on it every day. when i go to sign in to i messages on my computer, it’s as if there are 2 different iMessages accounts. The conversations are not the same, for example when i say something off my computer to a friend, it comes up as my apple ID, is there a way to get it to come up as my regular phone number, or at least some how so people know it is still me? for the most part it works great, but maybe you can help me with this. I also have an iPhone 4, and i use iMessages on it every day. when i go to sign in to i messages on my computer, it’s as if there are 2 different iMessages accounts. The conversations are not the same, for example when i say something off my computer to a friend, it comes up as my apple ID, is there a way to get it to come up as my regular phone number, or at least some how so people know it is still me?